Whether it’s a “Tailgate”, a pep rally, or a full day of games, there are many reasons why saving time for school spirit makes a difference no matter the age and stage of your students. In other words, you don’t have to be a high school or college to celebrate each other and your overall community. That’s what school spirit is after all. It warms a school, brings people together, helps them feel a part of something larger than themselves. Taking time to build school spirit enriches the student experience well beyond the cheer or the cartwheel. In fact, school spirit raises spirits, scores, and much, much more. In a letter to parents, Middle School Head Una MacCarthy explains how school spirit at The Lexington School builds leadership. I was asked by a parent why we make such a big deal about a just a middle school basketball game. This is the beauty of a K-8 school. Ending in 8th grade allows us to make a big deal about experiences that are often reserved for high school. TLS Middle Schoolers carry quite a bit of responsibility. They are the editors of the yearbook, the student council president, and the debate leaders. They write the school play, present their Capstone research project, and are the speakers at graduation. They are the big kids, the role models, the top-dogs. They are given responsibility and are held responsible for it. At the end of this year, we will take our 8th graders on a class trip that is hard to match. Nestled between final exams and graduation, the students and their teachers will board a plane and travel to the Southwest. They will dangle their feet not only over the edge of the North Rim of the Grand Canyon but over their childhood, and they will look back at who they used to be and forward to where they are going. All these experiences occur at a magical time when the young teen has the maturity to step up to the plate, take the challenge, and know what it feels like to be a leader. By the time they graduate, our TLS students have had many opportunities with great responsibility. Being a leader has been well practiced, and our students are ready to continue being leaders in high school. This is not a new skill set to develop but one that is clearly in their wheelhouse. Our students are confident and have a positive outlook about school and learning. Middle School was not something they dreaded or endured but something they cherish. So yes, we make a big deal about middle school games and everything else that are rites of passage and rally points of celebration, and we love doing it. It’s what makes a K-8 school so much fun. Google the benefit of a K-8 education, and you will find lots of articles that are research-based and data-driven. For me, it’s all captured in the faces on a day when just another middle school game is being played. Join in and have fun with us. Traditionally, high schools have owned school spirit. It’s not supposed to matter to kids in elementary and middle school. Instead, the pressure on foundational programs to check off the list of requirements for “the test,” leaves little time for play in most schools. Want to know how to build spirit in a school without a high school? Make your middle school your high school, and include everyone in celebrating the whole of your parts. Host “Tailgates” once a season for each sport. Promote it to the entire community and invite all to attend and join the team post-game for food and fellowship. Have a school-wide pep rally at least once a year. Involve everyone. Let your younger kids lead too. Take a day “off” for spirit once or twice a year. 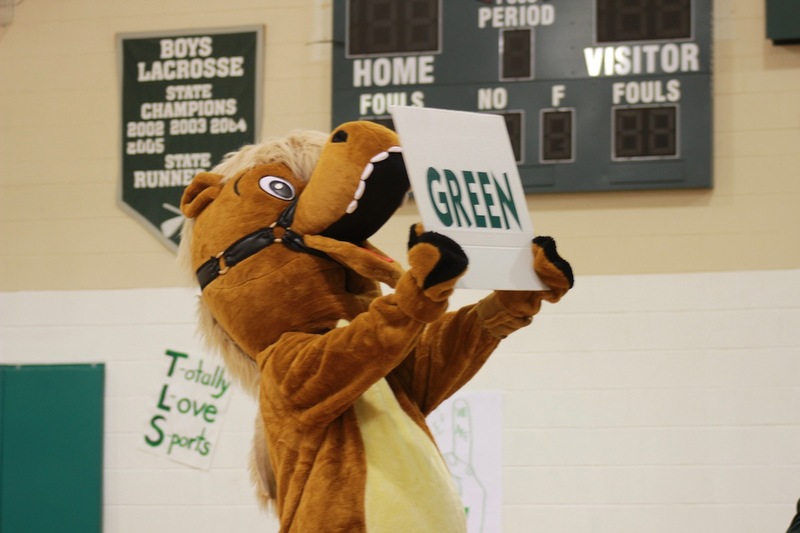 “Green and Gray Day” teams up the entire school for school-wide, friendly competition. Spirit Day in middle school is a wonky week-ender with grade-level silly competitions and fun. Celebrate student accomplishments outside traditional sports. Announce the great work of those in the Geography or Spelling Bee, chess tournaments, speech and debate teams. Be #TLSProud of everyone. Need a road map? See this Middle School Spirit Day agenda. HINT: you will need a spirited ENERGIZED faculty to pull this off, but if you are lucky enough to have those people at your school, then this awesome day of adult exhaustion really does pay off. School spirit is not reserved for the high school experience. Given the time and opportunity, it can raise spirits, raise scores, and a whole bunch more. GO FOR IT!